I’m going to be taking an intensive two-week course over the winter-intersession at MassArt called Installation: Reflective Space. I’m wondering if there are other media makers in the Boston area that would be interested in taking this class with me? Contact me if you’re thinking about it. It would be wonderful if there were some other media makers in the class working with video, sound, and projection so we can share tools and techniques. Installation: Reflective Space meets January 3–14, 2011, Monday–Friday, 9:30 A.M. to 4:30 P.M. in N-379, the class earns 3 credits and is offered through MassArt Professional and Continuing Education, visit their web site or call 617.879.7200 for more information or to register for the class. Download a flyer for the class as a PDF. Installation is a relatively recent art form that challenges traditional categories of art because of its impermanent nature and tendency to incorporate a multitude of influences. This course explores installation practice using diverse media, including but not limited to sculptural material, photography, drawing, video, and sound. Assignments encourage experimentation while reflecting on physical, psychical, and sociopolitical content in relation to the site, and include a shorter and more substantive project. Presentations, group discussions, and critiques enhance classes. Relating meaningful techniques and material to the space is emphasized over mastering shop skills. Students must have some experience with object making and the media they intend to incorporate in their projects. Danielle Sauvé is a sculptor and installation artist. She received her BA from Laval University, Quebec, and her MFA from Concordia University, Montreal. Her work has been exhibited in galleries and museums throughout North America and internationally. She has created permanent public art installations, and has pieces in the permanent collections of several museums, including the Montreal Contemporary Art Museum and Joliett Art Museum in Quebec. 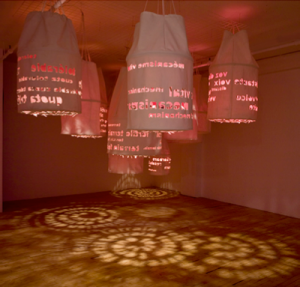 Photo: Danielle Sauvé’s Promises (Seeking Recognitions), 2010 (photo by Richard-Max Tremblay).